I recently found out that you can design your own M&Ms. Curious to find out what that meant, I decided to go to M&M’s website and try it. 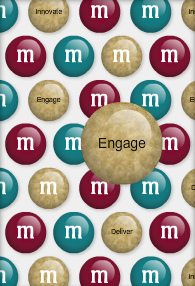 What captivated me about the My M&Ms part of the website is that I wasted no time figuring out how to use it. After choosing the colors the M&Ms would be produced in – and there was a vast array of them – I could choose to upload images that would appear on the M&Ms and write personalized messages. Finally, I had a choice of packaging to choose from. The result: teal, burgundy, and gold M&Ms that would make a great gift or promotional item. The self-created candies were too highly-priced for me, but creating my own M&Ms offered a unique customer experience. This shows how companies can strengthen their business by offering mass customization. You can read Gownder’s article here. Mass customization opens doors to innovation and a whole new level of interaction. Customers often dream up products that have never even crossed a company’s thoughts. The key to being successful at mass customization is to have the right tools to listen to what customers want. OneDesk was designed for companies who wish to bring customers into the development process and allow them to co-create. Through a customer feedback application that is easy to use and can even be embedded in a website, customers can send companies ideas about what they would like to see mass-produced. Companies can connect with customers and partners and use the interactive collaboration tools built into to elaborate on the ideas, understand them, and learn more about their customers. They can then turn these ideas into requirements, analyze them based on their corporate goals, and finally, turn the ideas into real products. Try today and give your customers the experience that will them coming back for more. We want to know: Mass customization usually starts with someone saying “I wish this product…’. Are there any products you wish you had your say in designing? I was wondering if there have been studies that quantify the value of customization. From a very real example, we know that you can purchase a plain T shirt for under $5 retail or you can pay $20 for a similar T shirt that has a Nike Logo on it. For some people, the Nike Logo may be worth more than an image they create themselves. Different product categories will enjoy different premiums for different reasons. I was wondering if anyone has ever studied this and if there is any information available on the findings. Thanks for your help. That’s a very good question, very thought-provoking. Thank you for bringing it up! I do not know the what kinds of studies there have been on the subject, but I am curious to find out. Let’s keep each other updated on our findings. I also encourage all our readers to provide information on this subject.